This Celica thumbnail enticed me to revisit the Regular Car Reviews channel for the first time in a while, which I was pleased to note that it has evolved beyond filling a lot of air time with fart sounds, it still includes interesting insights and context about the car we’re looking at. There were seven generations of the Toyota Celica, and its final form was a funky-styled front-drive sport(ish?) compact car; something of an Acura Integra/RSX rival in the mid 2000s. That’s probably what most casual car enthusiasts think of when they hear “Toyota Celica,” unless they’re into rally racing. It “doesn’t drive like it’s 40 years old,” host Mr. Regular says. What he means is that the Celica is consistent, responsive. He likens it to a 1990s Honda Civic: compliant and competent, despite the fact that it’d probably struggle to chase down the checkers in a drag race against a taco truck. I’m imagining that as opposed to its contemporaries I’m familiar with, like my dad’s ’79 Fiat Spider which is temperamental and sloppy, or my ’75 International Scout, which is extremely physical to drive (the pedals are far to push, and they’re heavy, the gearshift throws are very long, double clutching means you have to do a lot more dancing then you would have to in a newer car, the doors are extremely heavy and take a lot of force to open, you need to make constant steering adjustments because the thing wants to wander off the road all the time, you guys know how it is). 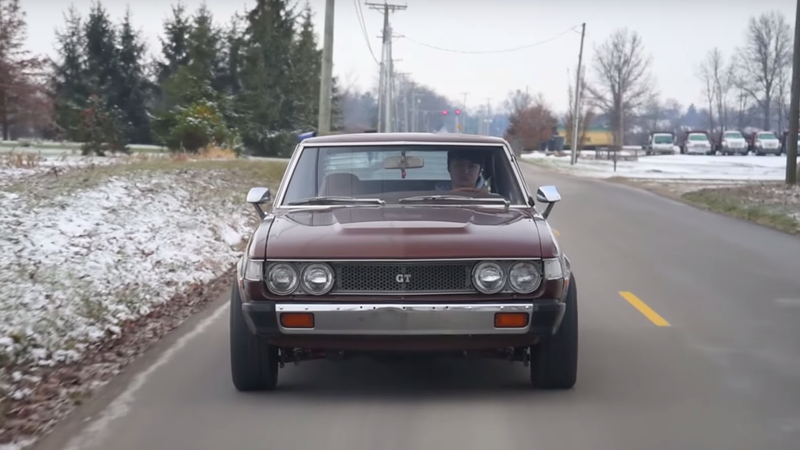 The Celica in this video has been upgraded with modern tires and performance suspension, which definitely plays a part in making the car feel, well, “modern.” But per Mr. Regular’s assessment, it seems like the smoothness of the engine and sharpness of the shifter simply made this car ahead of its time. And now it’s a cool culturally transcendent car in more sense than one. It feels old, but looks ancient, and therefore is something of an anomalous time capsule. At the same time, it bridges a major gap in automotive styling between Japanese cars and domestic cars. It’s definitely a product of the same vibes that drew things like the Ford Mustang II and AMC Javelin into existence, but it’s also one of the progenitors of tuner car culture. I always liked the look of the original Toyota Celica. After watching this video, I have a much higher appreciation for the car in general. Here’s hoping this inspires more people to save these.